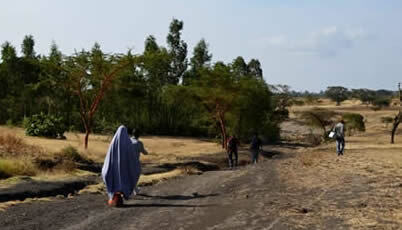 A health extension worker on her way to visit a household. The Last Ten Kilometers: What it takes to improve health outcomes in rural Ethiopia works to strengthen the bridge between households and the primary health care unit (PHCU), Ethiopia’s basic health service delivery structure. The aim is to improve high impact maternal, neonatal and child health (MNCH) care practices among the rural households and contribute towards achieving child and maternal health related Millennium Development Goals 4 and 5, decreasing child and maternal mortality rates. L10K is a project implemented by JSI Research & Training Institute, Inc., with grants primarily from the Bill & Melinda Gates Foundation and with additional funding from UNICEF and USAID. L10K works closely with the Ethiopian Government, and other development partners, and provides technical and financial support to 12 civil society organizations. With funding from the Bill and Melinda Gates Foundation, the L10K platform strategy in the 115 woredas (districts) enhances the interactions among frontline Health Extension Workers (HEWs) and Health Development Army (HDA) members, households, and communities to ensure that more, better, cost‐effective and equitable maternal, newborn and child health services are provided by the PHCU. L10K provides tools and skills to HEWs to work with their communities by organizing and utlizing the HAD network. It strengthens primary health care units by building the capacity of health workers and enabling health facilities to provide quality MNCH services. Family conversations promote key health messages to improve uptake of maternal and newborn health services including birth preparedness and complication readiness. The family conversation, which brings the pregnant mother and key decision makers within her family and environment together, is led by the HDA member with support from the HEW immediately after the identification of the pregnancy. The conversation continues through antenatal care (ANC), labor, delivery and the postnatal period. In addition to the platform strategy, L10K implements community- based strategies for evidence- based spread and scale-up.